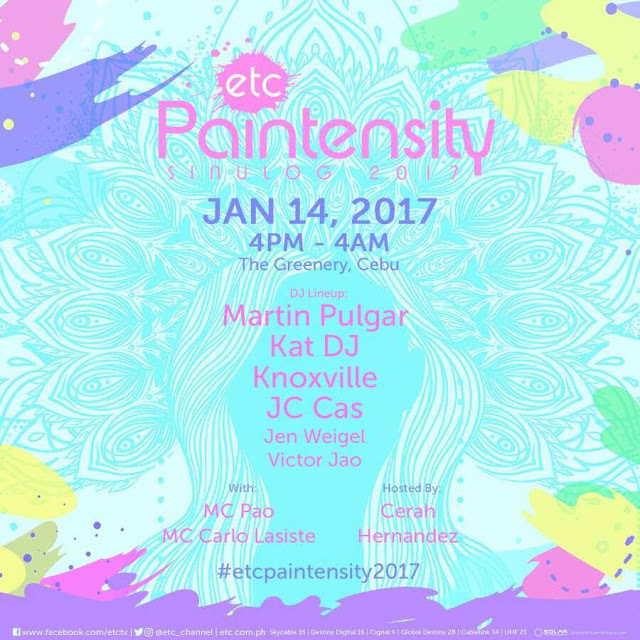 Paintensity 2017, Let's Paint Cebu With Colors! Pit Senyor! Sinulog is already in the air! On Saturday, everybody is on their way to the Greenery for the party of the day, Paintensity Sinulog 2017! A day before the Sinulog Grand Mardi Gras, Paintensity has become bigger, wilder and bolder this year! Head to The Greenery, Cebu on January 14, Saturday starting 4 PM to 4 AM and color the night to the beat of party music by top DJs like Knoxville, JC Cas, Martin Pulgar, Kat DJ, and more. ETC is also giving away limited edition ETC Paintensity shirt at the venue. Admission is FREE!